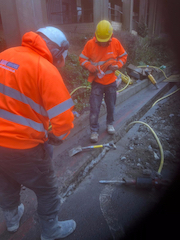 A1 UK Drains continues its contract maintenance work at Northwick Park Hospital in North London. Right now, our team is carrying out gully repairs to ease the soakaway of surface water in areas around the hospital. All our engineers are fully CRB (now known as Disclosure and Barring Service) checked and insured, so you can rest assured of a professional attitude AND service at all times.